February 28, 2018 March 7, 2018 / J.K. 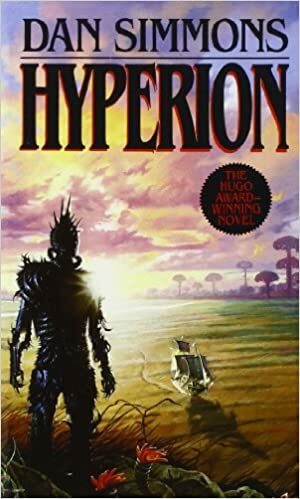 This is the first book the the Hyperion Cantos series and centers around the stories of seven ‘pilgrims’ as the travel to the distant world Hyperion and a voyage to meet the Shrike. The story take place 700 years in the future, where we have left Earth after it’s accidental destruction and colonized multiple planets throughout the galaxy. On the ship, each pilgrim – the priest, the soldier, the poet, the scholar, the starship captain, the detective, and the consul – tales their story. Each mini-story is incredible and interesting in it’s own right. But it is nothing less than impressive they way Simmons weaves the stories together with histories, biologies, geographies, ecologies, and political back stories of a dozens worlds and scores of peoples. It is an amazing, sprawling, interwoven, epic fantasy. I’m not a huge sci-fi fan, but I was impressed with this book and honestly shocked that it ins’t more famous. The shear volume and intricacies of the stories and back stories are impressive. I actually found myself staying up late to read and being excited to come back to the book to see what would happen next. I ordered the next book in the series as soon as I was wrapping this one up. I don’t know how much I should concern myself with spoilers for a nearly 30 year old book, but I’ll just say the pilgrim stories for the priest and scholar were so fascinating to me, that they are worth the price of the book alone. Either one could be it’s own novel, and the concepts Simmons put are great thought experiments. Of course, the book being so old, there are interesting parts that are oddly anachronistic now, which make them especially funny being projected in the future. For instance, one of the top technologies is the personal fax machine. But his concept of the ‘all-thing’ is basically our modern internet with smart phones, so that was interesting to see. Overall, a great, fun book that is a must read for anyone who likes sci-fi or fantasy, but also for anyone who enjoys thoughtful fiction.